Canning your own fresh beans will save you money. Green, wax, lima and Italian beans stay fresh in canning jars with the addition of a small amount of salt. Pressure canners work by using boiling water and steam to seal each jar and kill off dangerous bacteria. Beans, the most common canned vegetable, stay fresh for up to five years when stored and canned correctly. Try growing your own garden this year and canning fresh vegetables for a healthy diet. Place the rack inside the pressure canner. Fill the canner with 3 inches of water. 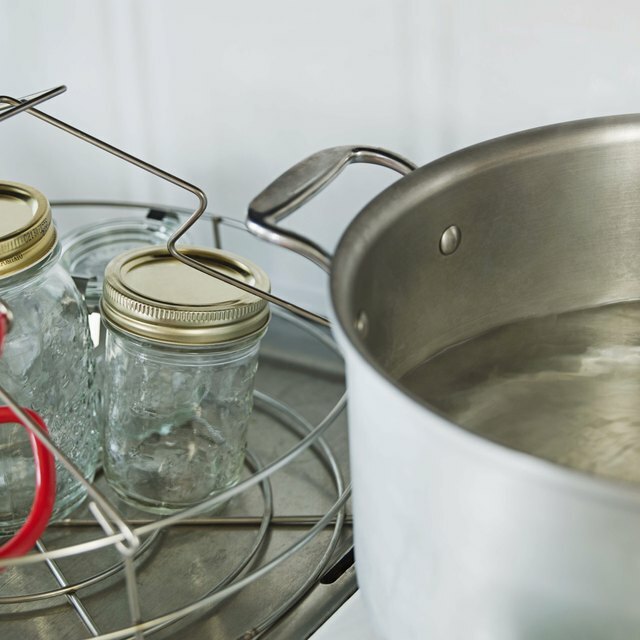 Because you will need enough water to cover the canning jars halfway, you may need to adjust the water level. Sterilize the canning jars in hot boiling water for 10 minutes. This will kill any dangerous bacteria. Break green, wax or Italian beans into 1-inch pieces and remove their ends. Run the beans under warm water, and remove any dirt and debris. Shell lima beans and wash them thoroughly. Add 1/2 tsp. of salt to each quart-sized jar. Place the beans into the canning jars. Pour hot boiling water into the jars, and leave 1 inch of space between the lid and the beans. Place the lid on each jar, and screw the band ring over the lid and onto the jar. Place the canning jars into the pressure canner. Lock the lid down by turning the lid to the lock position. Remove the air inside the pressure canner. Allow the steam to begin escaping from the canner's vent once the water starts boiling. Once the steam escapes for 10 minutes, cover the vent pipe with the weight. The pressure canner will begin to make hissing sounds. If you notice steam escaping under the lid, open the vent again to remove excess air. Allow the pressure canner to reach 10 pounds of pressure. Allow green beans to process for 25 minutes, and lima beans to process for 50 minutes, in quart-sized jars. Turn the heat off and allow the pressure canner to cool. Once all the steam escapes, remove the weight from the canner. If steam continues to escape from the canner, replace the gauge weight and continue to wait for the steam to release. Do not remove the lid if steam still pours out of the canner. Remove the lid from the pressure canner away from your face. Carefully remove the jars from the canner, and allow them to cool completely. Check the seals on the canning jars by pressing down on each lid. If the lid stays down, then the jar sealed correctly.Reprocess any jars that did not seal, and replace the lids with fresh and sanitized ones. Discard the water in your canner by pouring it into the sink. Refill the pressure canner with fresh water when canning another batch of beans. Store the canned beans in a cool, dry environment. Mark each jar with the date on which you canned it to ensure you consume the beans on time. Use the freshest beans possible. At altitudes above 1,000 feet, follow different instructions when canning. To ensure your safety before consuming the canned beans, check the jar’s seal by pressing down on the lid. If the lid pops back up and makes a clicking noise, discard the jar.